The Far Away, Right Here. There are a billion places to visit on this earth. At least. Amazing and incredible places. Now these places are said to be the hardest points to reach on the globe,. The experts who say so…. base this on the fact that they are furthest from a point of access …. specifically ….. a coast. And it is your lucky day. There is one on nearly every continent. They even put a few out to sea. Those are the ones that are…. way far away ….from land. I’ll just name a couple. One of the most notable is The North Pole of Inaccessibility. Not to be confused with Santa’s North Pole. No. This place is located a few hundred miles away. (Basically, it is the northernmost point that is furthest from land). And, like the North Pole, it floats around on a shifting pack of ice. So, a permanent physical location is impossible to define. Explorers have tried to get there. Lots. And. No one has. That we know of. And by “we” I mean me and my crackerjack team of internet scientists. On to a few more…The North American Pole of Inaccessibility is located just outside of a small town in South Dakota…. like… out in the hilly wilderness between the towns of Allen and Kyle. South Dakota. Who knew…. the Heart of it all. Every continent has one. Take the Aussies. Australia’s no-can-do point is only around 570 miles from the nearest coast. It is found in the Northern Territory, on a long stretch of dirt road between the community of Papunya and the waters of Lake Lewis. So. You can search far and wide for one of those billion places to visit on earth. Or you can start right in front of your nose. In fact….. tonight, we took a brief walk around the property. I’ve covered that path a thousand times before, but each and every time, I see something new. We saw chickens running. (Chickens are very funny runners by the way. They look like the last kid you pick on the playground for your Red Rover Team.) But our chickens were trotting along tonight. They may have been racing. 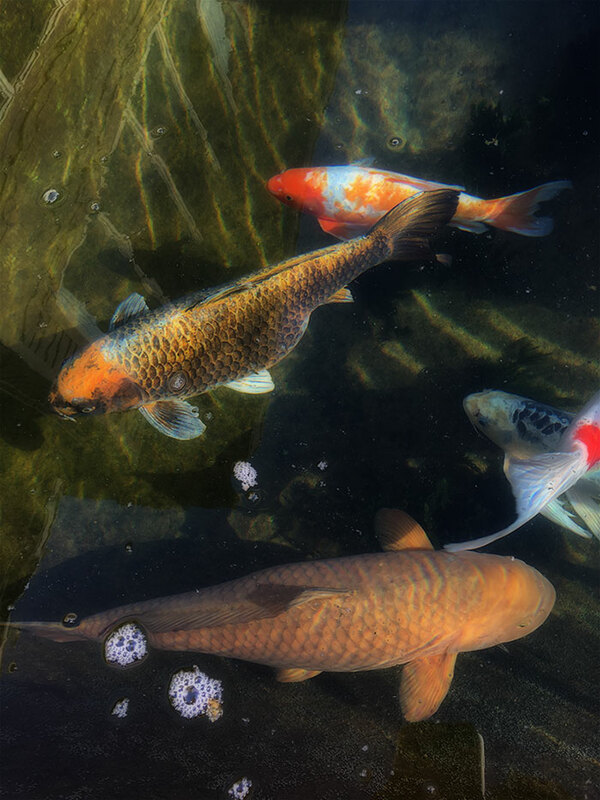 We saw Koi swimming and eating and swimming and eating. They are waking up after the winter snooze. And… they woke up hungry. Our pal Mike was here too. 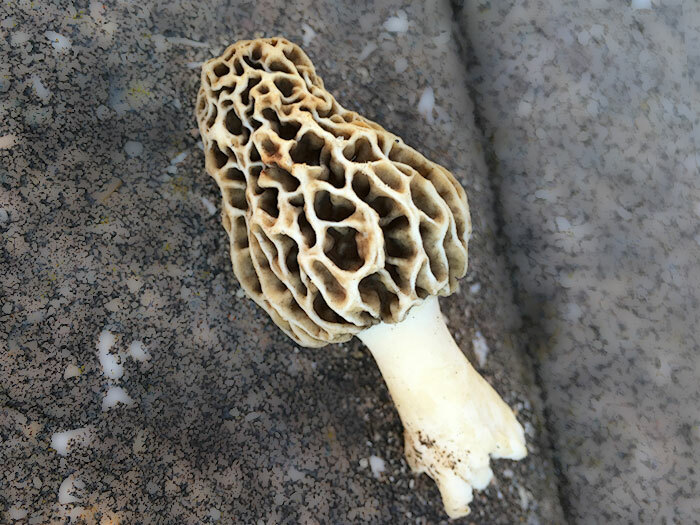 He nabbed the first Morrel Mushroom of the season. It was beautiful. Mary showed me a plant called Jacob’s Ladder. It doesn’t not look like a ladder, or even Jacob, for that matter. But it is Native to Ohio. Or so I am told by my team of botanical experts, aka Mary and Janet. We saw good birds everywhere. There were no Angry Birds. Just happy, good ones. So….. we listened to them sing. R-E-S-P-C-T… that is what it means to me… R-E -S-P-C-T… (I think they were Otis Red-birds). So we had a full night of exploring and fun. Now for me, this is much better than trying to get to the most arduous place on earth. Because once you get there, you pretty much just turn around and come back again. This way….If you turn around and around… you are making dizzy circles. And that is good too.